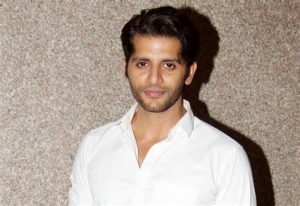 Karanvir Bohra is an Indian actor, producer and designer. He is best known for television roles as Prem Basu/Yudi on Kasautii Zindagii Kay, Dhruv on Shararat, Viraj Dobriyal on Dil Se Di Dua… Saubhagyavati Bhava?, Rocky Mahendra Pratap Singh on Naagin 2 and Aahil Raza Ibrahim on Zee TV’s Qubool Hai. He has also appeared in the films Kismat Konnection, Love Yoou Soniye, Mumbai 125 KM, and Patel Ki Punjabi Shaadi. He was a celebrity contestant in the 12th season of the Indian version of the reality TV show Big Brother, Bigg Boss, in 2018. Born Manoj Bohra on August 28, 1982 in Jodhpur, Rajasthan, India, to a Marwari family, Madhu and Mahendra Bohra, he is the son of producer and director Mahendra Bohra and Madhu Bohra, and grandson of actor-producer Ramkumar Bohra. He attended G D Somani Memorial School, Cuffe Parade and did his junior college from Elphinstone College, Mumbai in Science. He has been married to Teejay Sidhu since November 3, 2006. They have twin girls, Vienna Bohra and Raya Bella Bohra. *He was born on August 28, 1982 in Jodhpur, Rajasthan, India. *He is the son of filmmaker Mahendra Bohra. *He changed his name from Manoj to Karanvir in 2007. *He is a trained Kathak dancer and had received training from ‘Pandit Veeru Krishnan’ for two years. *He was a contestant on the reality show Bigg Boss in 2018. *His wife, Teejay Sidhu, is three and a half years older than him. *He owns a local clothing brand called Pegasus. *He enjoys dancing, playing cricket, and gym.